There is nothing that will fire up a gardener’s imagination in the middle of winter like garden seed catalogs! The same goes for perusing on-line garden seed sites as well. As the frigid cold chills the bones, they can be a great way to prepare early for your garden. And they are pretty good at keeping cabin fever at bay too. All good gardens start with great seeds! 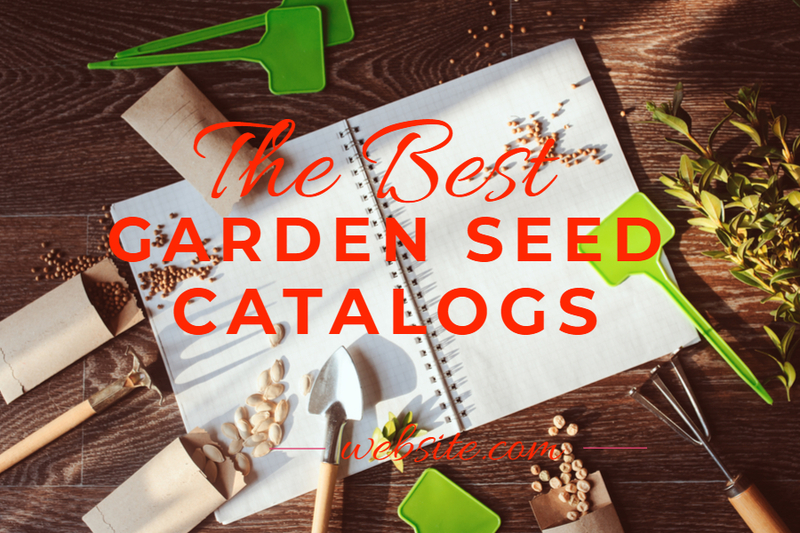 A look at some great garden seed catalogs and websites for garden planning. And, getting those seed orders in early is a great way to ensure you get the seeds you want. It also allows for plenty of time to start them off indoors before spring arrives. Here is our list of six favorite garden seed catalogs and seed websites to get you ready for next year’s growing season! 6 Great Garden Seed Catalogs For Winter Reading And Ordering! The Mountain Valley Seed Company is a company with history, providing seeds for gardeners for decades. Their amazing quality and selection of seed have a big following among backyard gardeners. From vegetable and flower seeds, to herbs, microgreens. cover crops seeds and more, they have seeds for every type of garden. Mountain Valley’s huge selection of Non-GMO, open-pollinated, heirloom and certified organic seeds are wonderful for the organic gardener too! Their on-line website is equally impressive. Each seed variety has a complete planting description. It also lists a a brief history each seed and plant. Baker Creek takes seeds and gardening to a whole new level! For starters, they have over 2,000 varieties of vegetables, flowers and herb seeds available for purchase! Baker Creek offers nearly any variety of gardening seeds you can dream of – and more! Their on-line site is a virtual encyclopedia of gardening information. And their catalogs are something to behold too. Baker Creek offers a beautiful full-color seed catalog for free. But if you want a gardening keepsake, you need to check out their Catalog book. The photography of available heirloom vegetable plants is simply stunning. In addition, each seed selection comes complete with full-length descriptions of the seeds. It also includes how and where they were collected. There is a charge for the book ($9.95) – but it is well worth the cost. As another option, many libraries carry the copy for viewing as well. Based in Greendale, Indiana, Gurney’s is a mail-order seed company that was founded way back in 1866. Gurney’s specializes in vegetable and flower seeds, as well as nursery stock. That includes everything from fruit trees and berries, to perennials, shrubs and more. Both their catalog and their website are a wealth of information for the home gardener. They include everything from planting information to gardening guides and videos. Gurney offers a free catalog through their website that can be mailed right to your door. The Harris Seed company has been growing, saving and selling seeds for 139 years. Without a doubt, they know seeds! They have long been known as a seed supplier to growers, but now have a division set up for the home gardener. Harris’s Garden Trends website and catalog cater to home gardeners, and have all types of incredible seeds available. Harris Seed’s Garden Trends catalog can be ordered via their website for free, and is published each January. It features vegetable seeds, annual and perennial flower seed varieties, garden ready transplants, flower bulbs and tubers for the home gardener. Johnny’s Seed Company has been organically farming for over 40 years, and they take seed saving seriously! Johnny’s is a 100% employee owned company, and many of their customer service representatives are actually Master Gardeners. You can’t ask for more than when it comes to getting advice for your garden and landscape! Their catalog and website offer hundreds of varieties of certified organic vegetable, flowers, herbs and fruit seed. All of their seeds are certified for organic production, making them great for those looking to grow for farmer’s markets and more. Johnny’s seeds can be ordered on-line, or through their free catalog, which can be ordered via their website. Filled with gorgeous pictures and detailed descriptions of hundreds of heirloom and open pollinated seed varieties, Seed Savers seed catalog is a wonderful resource for the home gardener. Their full-color catalog is filled with educational seed information that is perfect for garden planning or simple garden dreaming. Seed Savers Exchange is a non-profit, member supported organization that is dedicated to saving and sharing heirloom seeds. They collect and grow heirloom seeds and plants at their 890 acre farm in Iowa. Christmas Cactus Care – How To Keep Your Holiday Cactus Healthy! Seed Starting Supplies – The 5 Basic Items You Need For Success! March 9, 2019 TIMG Comments Off on Growing Clematis – The Climbing Perennial With Big Flower Power!